Originally from the Ukraine, Andrei Yakovenko immigrated to Canada 20 years ago with less than $5 in his pocket. Determined to succeed, he built a successful career as a partner in a Geophysics business. Years later, Andrei came across Body By Science. After putting the principles into practice with a group of friends, Andrei saw profound physical changes, and began learning all about high intensity strength training. Andrei discovered how HIT had the power to transform lives, including his own. 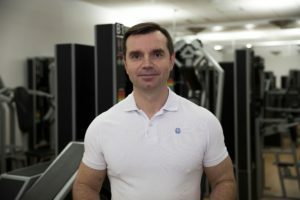 Andrei decided to leave his high paid career in Geophysics and setup New Element Training, a high intensity training studio in Toronto, Canada, that specialises in mindful strength training. Please note: Some episodes that have been recently published were recorded after my podcast with Andrei. If you’re a regular listener you may notice some inconsistency in my thoughts and this is why. Big fan of mindfulness. There’s a great book called the power of now by Eckhart Tolle which I think describes it excellently and definitely helped me to improve my life. The headspace app is very good and a good introduction into mindfulness. I would argue that if you aren’t present during training that you aren’t doing it correctly. Certainly training to failure makes you become present! Then I came across work of Philip Shepherd (check out his book: Radical Wholeness, and website: https://philipshepherd.com/ ). In contrast to Eckhart and other teachers, Philip actually points to a physical place in your body where we can land on stillness in a very felt/experiential, as opposed to an abstract, way. Changed everything for me! way. Changed everything for me! anything else you have read before. of discovery our mind is empty. HIT makes it fairly easy to achieve b/c the sensations are so acutely felt. Glad you are giving it a try! failing, but you are smiling at the same time b/c it is joyful. It certainly requires practice. Isometrics would work as good.